Longhorn steer shipped by rail to Kansas City in 1924. Placed in the quarantine section to inspect for tick fever. An old mature steer, perhaps 15 years old. Weighed 710 pounds. Sold for 6 cents a pound to the Cudahy Packing Co., where he was killed by the hammer. Horns hung in the office of Cassidy Southwestern Commission Co. from 1924-1972, a firm for whom my dad bought cattle. 4 feet 9 inches, tip to tip. One of the classic early-day Longhorn shapes. A website dedicated in pictures and text to the study of the horns of Texas cattle, early steer horn furniture and related items, beginning from the days of trail drives and into the 1930's. This learning center is devoted to educating interested parties about authentic, historically-correct Texas Longhorn cattle and their horns. Here you will learn about the sizes, shapes & colors of the horns of bulls, steers and cows with interesting facts about the Longhorn's history, the Old West, cowboys and trail drives. Superior Example of the Corkscrew Twist. Steer of the 1880's. Probably Born the Early 1870's. Throughout this site, enhancing the photos, Alan Rogers has included fascinating facts about Texas Longhorns. This impressive dresser is one of several pieces displayed at the 1904's World's Fair in St. Louis. It was made by Herman Metz, a St. Joseph, MO fireman who made horn pieces as a hobby. 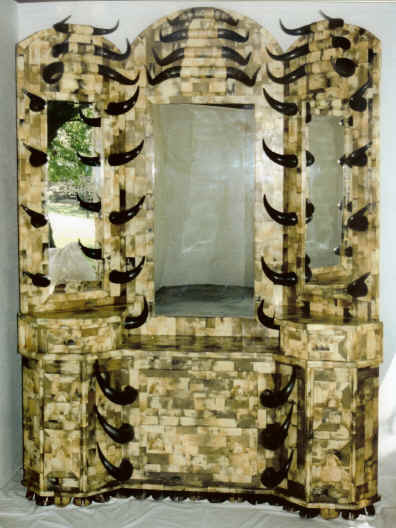 During the height of the horn furniture craze, dozens of individuals across the United States made something of horn. On this site you can learn about horn furniture, some of its makers, and see representative pieces. Click on the links below for more information. To learn more about Herman Metz and this dresser, click here. Thank you for visiting the Longhorn Museum! You might want to start by reading about Alan Rogers. and be sure to visit all the links in the Learning Center (see above). To contact LonghornMuseum.com, click here. Click on the following links to learn about old steer horns, horn furniture & related items! This internet museum is an educational site, receives no monies from any source, and is totally self-supported by its founder. All images are shared as allowed under the Fair Use doctrine, Title 17 of the U.S. Copyright Code, for research and study purposes, only. If any exist, no copyright infringements are known or intended.